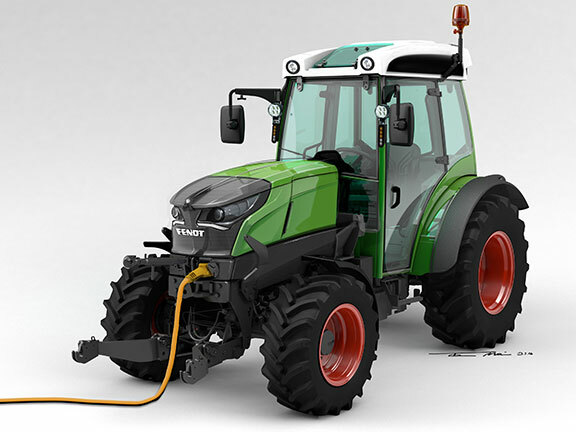 AGCO Fendt won a silver medal from Agritechnica for its world-first all-electric tractor called the Fendt e100 Vario. The Fendt e100 Vario is an all-electric compact tractor with 50kW power output, which can operate for up to five hours under normal operating conditions. This tractor will be used for the first time in 2018 in limited numbers initially on selected farms. The energy source is a 650-volt high-capacity lithium-ion battery with a capacity of around 100kWh. The battery is charged either with 400V and up to 22kW via a standard CEE outdoor socket or by a supercharging option with direct voltage. With a standard CCS type 2 plug, the battery can be recharged up to 80 per cent in just 40 minutes. In addition, energy can be recovered thanks to the use of an electric motor. A standard PTO connection is also available, as well as the normal hydraulic supply to implements. Therefore, the Fendt e100 Vario can be used with existing equipment with no additional caveats, but is also equipped to reap the benefits of using electrical implements. Precise and dynamic control is enabled thanks to the electrical drive. The maximum torque for the ground drive and PTO drive is supplied from a standing start. Safety is guaranteed by an insulated design and continuous, electronic system monitoring.